Prestige Mills brings a wide range of floorcoverings from all over the world. The finest Wools, Nylons and Acrylics are brought together by state of the art manufacturing facilities to create truly unique carpets. Bromley, a luxurious New Zealand Wool woven velvet is a unique texture that is comfortable in any design setting. The rich earthtones create a wonderful sense of tranquility for the home. Montgomery is an innovative carpet and border created from the classic color palette of today's interiors. Crafted using a fine acrilan fiber, this carpet gives the rich texture of a wool carpet at a more modest price level. The coordinating border allows you to compliment the field design for area rugs or bordered wall to wall installations. The classic wilton trellis design is captured in this modestly priced tufted nylon carpet. Stratton offers a broad range of colors from the rich greens, blues and pink to the soft neutral beiges. The coordinating border can add a touch of elegance to a wall to wall installation or frame the carpet for a beautiful area rug. 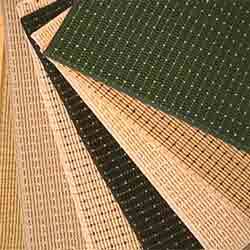 Sisal carpets have long been a standard in the Prestige Mills carpet line. We offer dozens of varieties of patterns and textures in a fibers ranging from Sisal, Jute and Coir to the newer wool sisal blends. Our extensive product line can be finished with fabric borders, jute and canvas tapes for area rugs, installed as wall to wall carpets, or set into a room as a canvas upon which to place fine antique rugs.